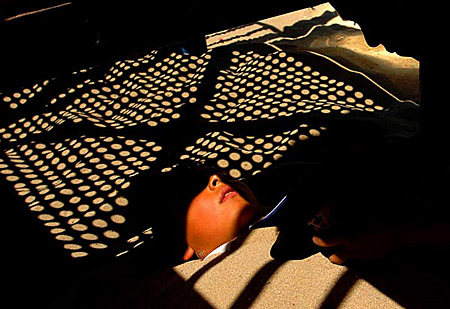 Twin brothers, Louis, left, and Juan Sanchez, top right silhouetted, avoid the heat by burying themselves in the sand under a jungle gym at Echo Park in Los Angeles, Aug. 9, 2004. It was a remarkable summer interning at the Los Angeles Times. Never could I have expected to spend ten weeks with such a superior group of photographers, editors and friends. During the many hours working in the field and lab, editing with a supervisor and assisting the talented staffers, I feel I have grown, both as a photographer and as a person, in these past few months. Before leaving home, I thought I had good variety in my shooting skills. I thought I was giving all I could to the Ohio newspapers I worked for. In class I felt I was learning and growing as quickly as possible. But none of my classes prepared me for the depth of knowledge and respect I've gained for the art of photojournalism in only one summer. When people ask about my internship in L.A., usually their first question is, "What was your best/favorite assignment?" I always struggle to answer because it really wasn't the assignments that defined the experience. It was the people I worked with-their camaraderie, knowledge of the art, true skill, and most importantly, the countless new friendships we made. Many times during the 10 weeks the editors said that every staffer is a thoroughbred, and nothing could be closer to the truth. As the internship wrapped up, several coworkers said they wished they could have helped me more during my short stay. But what they didn't realize is that I learned more than I ever could have imagined from each of the staffers and editors I met. Like Genaro Molina and Damon Winter: They blow my mind with the amazing portraits they take for the Calendar section. I was fortunate to be asked to assist both on different shoots. LA Times photojournalist Genaro Molina photographs rocker Jack White of the White Stripes in LA's Union Station. Caplin assisted Genaro on this shoot. Genaro taught me how important it is to research a subject and locations before a shoot. I worked with him on a portrait session with rocker Jack White of the band "The White Stripes". Genaro scouted locations for the portrait a week in advance at Union Station. Because he researched Jack enough to know that he really liked the old art deco architecture of the station. He also found out who Jack has played with and listened to his music so they would have something to talk about during the session. It paid off. Damon amazed me with his use of reflectors in his imagery. It was fascinating how he could make such wonderful images by working only with the available natural light. The same goes with Beatrice de Gea's portraiture. Her work is inspiring with the way she sculpts the natural light in a room. I can't wait to use some of the techniques I learned from these and the many other photographers in my own work. On my last day Senior Projects Editor Gail Fisher helped me to gain an improved understanding for the art of a picture story. The previous year, I took a picture story class in which I completed three projects. Gail took the time to review them with me, even going so far as to examine the entire shoot, adding, subtracting, and rearranging the order of some photos to improve the stories. She helped me understand that one need not be so literal with the order of photos in a picture story, and that I needed to work on making better visual transitions to lead the audience through the story. These are just a few examples of what I've taken away. I feel that I've grown so much during this short internship. I learned something valuable from each and every photographer, editor, designer and reporter. I look forward to applying as much of it as possible during my senior year at Ohio University. I don't know where I'll end up after graduation, but I know that this internship will help me get where I want to go. To the staff at the Los Angeles Times, I offer my humble gratitude for the wonderful summer and all the newfound friendships.